This post was originally published in Methods & Tools magazine as Breaking Bad: The cult of not giving bad news. I have updated it since then and re-published here as I have collected more learnings since then. It stemmed from something I kept observing, which really bothered me; why is it so hard to break 'bad news'? Why is there a cult of people who do not want to give bad news about the status of their delivery to stakeholders? Why do we let our fears cloud our judgement? Things can seem bad when they don’t go as we planned and hoped, but in reality things ‘just are’. As Esther Derby puts it "[our] ability to ‘face the truth’ and take effective action rests on the ability to be in a mental state where our emotions and fears aren’t running us” So how do we remove that fear and emotion, create an environment in which we are not afraid to break ‘bad news’ that allows us to make informed decisions. What is ‘Bad news’ anyway? For both of these situations, the response and emotion of the stakeholders receiving the news, and those giving the news is going to be very different. In the second one, someone would be pretty disappointed, upset, or angry; the news would likely become much more emotionally charged. The key is not to promise and commit to something you have no control over. Every delivery seeks a desired state, an outcome that benefits someone. Bridging the gap between that desired state and the current reality is the role of the delivery team. News is the mechanism to communicate that gap. The problem starts when we set detailed expectations far in advance and lose focus on the original outcome. This results in a fixation on the outputs and the perfect plan; that plan becomes the objective by which the team are measured. Many agile projects are no different, with a focus on a detailed product backlog far in advance of any delivery; a long committed list of things to be accomplished. The result is the iterative delivery of a pre-determined solution to which the expectant stakeholders have become fixated; any deviation from this is an emotional disappointment. The truth is, when our best-laid plan meets reality, it has a nasty habit of doing unexpected things. Kent Beck noted that “Optimism is an occupational hazard of programming; feedback is the treatment”. In terms of project and product delivery, ‘news’ should be treated as that valuable feedback. 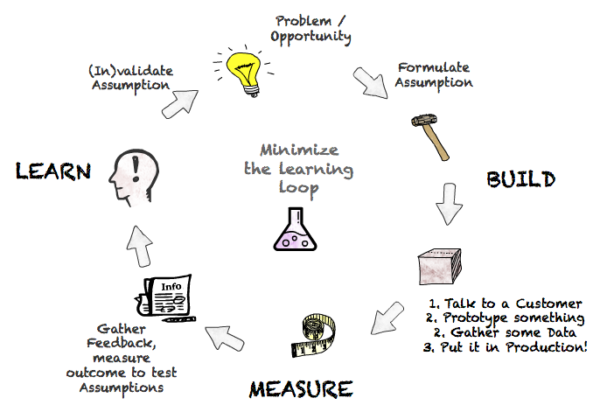 At the heart of agile is empiricism; knowledge based on observation and feedback. That feedback is ‘news’, without it we lack the ability to make informed rational decisions. The news has to be a timely check that enables us to take action. If not, we need to question - are we actually being agile? or is it just incremental development of a fixed plan and a given output? Product Roadmaps should be lists of questions, not lists of features and they should be linked to achieving a desired outcome. If we have this mindset and treat ‘requirements’ as assumptions, a best guess that needs to be (in)validated through feedback, rather than a 'given' that must be achieved, it completely changes the way we approach news. News becomes the learning achieved by taking our assumptions for a reality check, by using short empirical feedback loops. A backlog item that we treat as an assumption, rather than a given, makes the ‘desired state’ an outcome that is awaiting feedback to (in)validate. By calling it out as an assumption it reinforces that we start with imperfect knowledge. It removes the perception that there is certainty and creates the right environment for a product delivery team; we are on a journey of discovery together. It also helps put focus on the outcomes, rather than the outputs. The success through (in)validating and measuring that outcome, takes the emotion out of the news; as Hitchens razor states “What can be asserted without evidence, can be dismissed without evidence”. Take your assumptions for a test drive. This framework for delivering enables the benefit of learning through feedback; isn't that what agile is all about?. Delivery becomes a series of feedback points, assessing the best route to achieve our desired state. As humans we tend to choose the second option; we would rather be told a reassuring lie than an inconvenient truth. It can be very hard for us to face reality; but being able to change direction if you go down a dead-end path is all part of an empirical process. We need to be comfortable embracing ambiguity, why predict, something when we can reality test assumptions and fears. Fear is especially strong when we are bringing something new into the world, where there is innovation and uncertainty. There are things in this situation we cannot control. Fear should not drive your decision-making; the important thing is to be objective. Who are you protecting by not giving the information? Is it that we fear what others would think of us? Or that ‘I’ll get the blame’, or ‘I’ve made a promise…now I’ll look bad’. The courage to treat news as feedback, comes from within the individual. 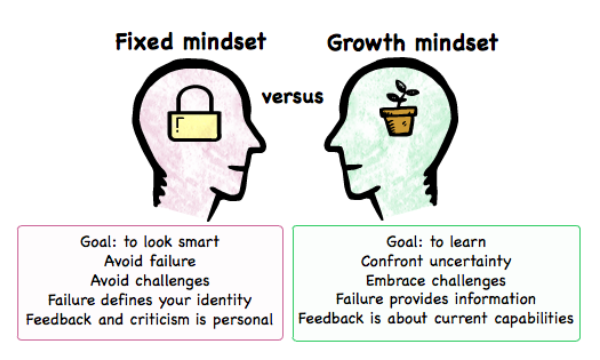 Carol Dweck highlights this with the concept of the ‘Fixed’ versus ‘Growth Mindset’. The Fixed mindset is one where we need to be perfect right away and any ignorance is seen as a failing. The Growth mindset however is about thriving on a challenge, seeking opportunities to grow and learn; it's about being unafraid to speak up. I used to work in a Telco product development company, where the CIO would ask us, his delivery teams, ‘What did you fail at this week?’ He would be curious if we had nothing to tell, and if our updates was as he put it ‘suspiciously green’. He knew many people become paralysed by the fear of failure, afraid of what others will think. Failure is life’s way of nudging you and letting you know you’re off course. The job of a leader is to create a safe environment, where we don't seek to blame and news can be openly shared; otherwise we need to question whether we are truly working in an agile environment. Don’t let failure define you and don't try and reinterpret reality to avoid being wrong. Failure is not an identity it is just feedback and information. How we as individuals respond to it, defines how we socialise news with others and in turn how we interpret it. Agile is a team game; we succeed or fail together. An individual does not reside in a delivery vacuum. Mindsets change the meaning of failure, but even if the individual has that Growth mindset, their environment has to support concrete feedback and open communication. The Amygdala is an area of the brain, which, amongst other things, is responsible for decision-making and emotional reaction. It frequently asks the same question about its surroundings’ ‘Am I safe?’ if you are and things are familiar, you remain calm and collected; if not it sends fight or flight self preservation response to the rest of your body, to get away from the situation. We are feeling creatures that think; we need to feel safe in our environment, so that our emotions and fears are not running us. We need to know that it is safe to fail. Make it timely: Bad news does not get any better with age. Fast and early feedback is the key to ensure timely decisions can be made. Minimise the learning and feedback loop, as there is nothing more frustrating to be told something that is now far too late to take any action over. Assumptions Driven Development: Treat everything you do as an assumption, a best guess that needs to be reality tested and (in)validated as quickly as possible. An assumption leads to an experiment and the feedback becomes the 'news'. Drop the jargon: The recipient needs to understand the news you are conveying, so drop the jargon and use language and terms that they understand. News such as - ‘our velocity was impacted due to technical debt’, may not be understood by all your stakeholders. News has to be absorbed, processed and understood. Visualise, visualise, visualise: Make it visible and accessible, because, as a colleague of mine used to say “no-one ever shouts at the board”. Information on a board makes the conversation far less emotive. Same team, same message: Take it in turns to deliver the news. There are many shoulders in a team and you should be happy to share the same message. Watch out for the situation where one person is filtering the news. You don’t want to be afraid of your team talking to stakeholders around the coffee machine and ‘giving the game away’.